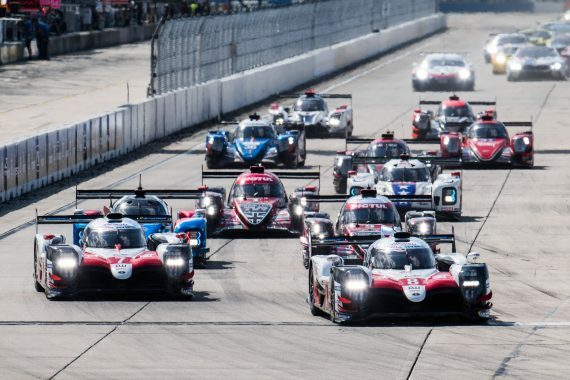 Mike Conway made it five podium finishes from six races this past weekend as he helped TOYOTA GAZOO Racing to another 1-2 finish in the 2018/19 WEC Super Season at the 1000 Miles of Sebring. On the back of a three-day test in February plus a WEC collective test the previous weekend, Mike and the team started the weekend with some comprehensive running already under their belt and kicked off the beginning of the event with two 90-minute practice sessions. In front of an already-substantial crowd, the #7 TS050 HYBRID of Mike Conway, Kamui Kobayashi and José María López set the fastest lap time of 1min 41.730secs of the day during second practice. The #7 TS050 completed 92 laps, 553 kilometres, in the first day of running to complete a successful start to the weekend for Mike and his Toyota team. Qualifying took place in the darkness of Thursday night, adding an additional challenge for the drivers, alongside the constant battle to find clean space on the 6.019km track that is notorious for heavy traffic due to the proximity of the walls and the unforgiving kerbs. The night proved to be a frustrating one for the #7 car, which had topped two of the three practice sessions in the run-up to qualifying. Mike was first behind the wheel but could not match the #8 car’s pace on his flying laps, while José Maria Lopez faced traffic on his first lap and made a small error on his second before holding his nerve in the closing seconds to record a competitive time. This meant the #7 team could only manage a best average time of 1:40.803,to secure second place in an all-Toyota front row for the 1000 Miles of Sebring. The team’s first race at Sebring began in bright sunshine and with an air temperature of 28°C as José started the race for the #7 and put the pressure of the sister #8 car through the beginning phase of the race in Sebring. The battle continued on continued until a brief rain shower just before the two-hour mark. Soon after that, the #17 SMP car crashed heavily, causing a full course yellow and then a safety car to repair barrier damage. That closed the field, bringing Kamui, now behind the wheel of the #7, closer to Fernando Alonso in the #8 and the battle resumed after 15 minutes. 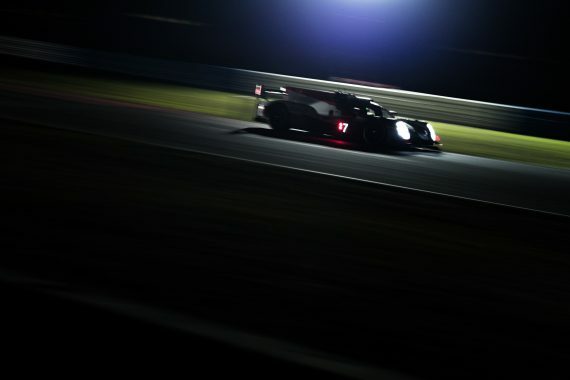 As the adverse weather conditions continued, heavy rain in the local area missed the track and the TS050 HYBRIDs kept up a close fight as darkness fell. At half distance, Mike was now behind the wheel of the #7 car and was flying out on track and pulling in Kazuki Nakajima in the #8. With Mike managing to reduce the gap to the #8 to just a few seconds, the titanic duel between the two TOYOTAs was brought to an early end after four-and-a-half hours when José, at the wheel of the #7, suffered a minor contact with the #90 Aston Martin. That required a change of engine cover and rear bodywork, which cost four minutes in the pits, putting the car a lap down. The #7 crew showed strong spirit to come back from the disappointment of losing a lap and set competitive times to comfortably extend their advantage over third place. That became slightly easier when a safety car was called with only 12 minutes remaining due to an accident for an LMP2 car. With heavy rain continuing, even driving behind the safety car was challenging but Mike stayed calm in the #7 and brought it home in second place. This entry was posted	on Tuesday, March 19th, 2019 at 9:00 am	and is filed under Featured, Motor Racing. You can follow any responses to this entry through the RSS 2.0 feed. Both comments and pings are currently closed.